I’ve used OutLinker to process a couple thousand email messages, and generally it is working well, but I recently noticed a couple capture maps that it had sent tasks to would crash MindManager if I brought certain topics into view. I discovered today that the problem is that these tasks happen to have the string “link” in them. As I mentioned in “MindReader: How to Best Read your Mind“, the original “link” and “note” keywords used to tell MindReader to use the clipboard contents as a note or link were prone to false positives (e.g. “notebook”) and have been replaced by islink, see link, isnote and see note. use of control shift g.
As it turns out in this case, the “link” keyword was overriding the OutLinker keyword and causing the MindManager link to include both the Outlook link and the message body. When MindManager scanned the link to get the icon to display for the link, it would choke on the malformed link. I apologize if any of you have experienced this issue. The latest version of MindReaderNLP.mmbas in the Macro Library avoids this problem and also scans your destination maps as it opens them to repair any existing links. If you are using Outlinker, please download this version immediately. I’ve been playing around with Oulinker for a couple of days, and so far it has proven very useful! This is a great way of ensuring the actions hidden in emails are actually done (either by me or someone else). The object was a meetin invitation, which I hadn’t responded to yet ; obj.Class = 53. Let me know if you need additional info, I’d be happy to help out. Thanks for your great code, both Outlinker and MindReader are saving me a lot of time (and better yet, reducing the pressure trying to keep overview)! Thanks Marco — right you are — that was a bug. I uploaded a fix. I’ve been tweaking the code so that it keeps looping on selection items until you cancel, quit, or get through everything. I hadn’t anticipated situation when only thing left would be appointment request that it would loop over. I’m glad to hear you are making use of tools. I’m finding Outlinker to be very impactful. From a development point of view I’m finding the key is actually to make it good at NOT sending stuff to MindManager. The more you can delete/archive/reply-to on the fly the better. Make sure you take advantage of the new p/n/i keys. MR just crashed on me – “Run-time error ‘6’: Overflow”. clicking debug points to “For i = 1 To Len(astr)” in “Function validxmlchars”. Trying to step into the code just repeats the error. The Subject line being parsed was “Reply to Micky.Mouse about POPS reports t1!c [compmap]” where “t1!c” is an alias for [today P1 Deadline Commitment]. Any thoughts and is there anything I can do to help debug the error? Hi Ron — There was a period of time when mindreader was inadvertently adding links that included the body of the message and causing crashes. Beforel that root cause was identified, I had thought the crashes might be due to non valid xml characters sneaking in with the body of email messages so added the routine you are seeing crash now. I think the problem is likely the message text being too long but haven’t checked. I just uploaded a new version that removes the xml routine that is causing the problem. You should be all set with that one. Is there a way to use GyroQ to send a task or appointment straight to Outlook? I use mm7 and love it, but when I need a quick reminder It seems a little convoluted to use GyroQ for this with the current process process. Would you want the GyroQ task/appointment to go to outlook instantaneously or when you sent queue? When I sent the queue would be fine. 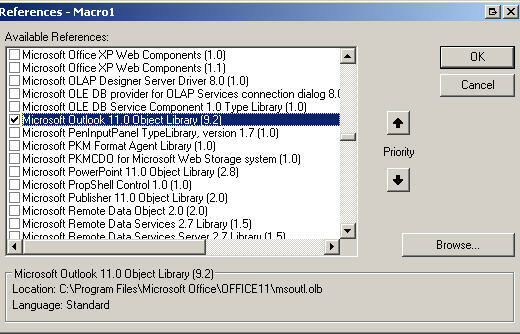 You need to add reference for Microsoft Outlook 11 (or 12) library. After using Outlink on my home-PC (Outlook2007), I decided to also run it at work (Outlook 2003). My “procedure” is to go through my inbox using Outlinker – things that can be done right away I do jus then (using r/ra or i key). Items that take longer than a few minutes I move to my action items in MM. Then once or twice per day, I go through my Sent items using Outlinker too. I noticed this “problem” did not occur on my home-PC so I decided to compare Outlook settings and found the cause of this behaviour. I’m using an international version of Outlook, so the description can be a little different from what I’ve given above – but you should be able to find it there.